The Montreal Neurological Hospital is a unique academic medical centre dedicated to neuroscience. Here, multidisciplinary teams of basic and clinical scientists generate fundamental information about the nervous system and apply that knowledge to understanding and treating neurological diseases. The Neuro will relocate to the Glen site in the near future. Until then, it will continue providing safe and high-quality patient care and conducting world-class research at its current site on University Street. Find out more about the Neuro by visiting their website at theneuro.ca. The main entrance of the hospital is at 3801 University Street, located north of Pine Avenue. Cars or taxis may drive up to the main entrance and drop off passengers. Click to see the MNH hospital map. Handicap entrances are north of the main entrance on University Street, or through the ambulance entrance at the rear of the hospital. The nearest metro station is McGill on the green line, which is located at the corner of University Street and de Maisonneuve Boulevard. It will take you approximately 20 minutes to walk from the McGill Metro station to the main entrance of the hospital. #24 at Sherbrooke Street and University Street. Parking near the hospital is limited. There is a parking lot north of the main entrance on University Street, where the rates are posted. Weekly and monthly permits are available for visitors/patients from McGill University (514 398-4559). There are also a few handicap spaces available off University Street through the ambulance entrance, just south of the main entrance. Reserved areas and signage must be respected at all times. Individuals who do not respect the No-parking signs may be ticketed or have their car towed. The Admissions Office 514 398-1900 will try to let you know in advance of the day and time you will be admitted. In some cases, your admission date could be delayed on short notice. Upon arrival, you should register with the Admissions Office, 165C on the ground floor near the Information Desk, and have a hospital card made (if you don’t already have one). Please follow any pre-operative instructions that may have been given to you. Although the hospital provides hospital gowns, you may feel more comfortable in your own pyjamas/clothing, housecoat, and slippers/shoes. You should bring a toothbrush, toothpaste, tissues, shaving items, soap, skin lotion, sanitary supplies and other personal-care articles. Since storage is limited, you are asked not to bring large suitcases. Please bring all medications that you are taking. This will ensure that the admitting physician or nurse can verify the exact medication and dose that you have been prescribed. You should also bring your valid Medicare card and Neurological Hospital card. If you do not have a Montreal Neurological Hospital card, the Admissions Office staff will make one for you. Please do not bring any items of value. If you do, you will be asked to turn them over for safekeeping or to sign a form, which releases the hospital of any responsibility. If a theft or a loss occurs, you should immediately make a report to your nurse. While most people wear their wedding rings, you should leave valuable watches, precious jewellery, cash, and credit cards at home. Bring only enough money to pay for the phone or television service or for incidental items. When not in use, dentures, eyeglasses and hearing aids should be placed inside your bedside table in containers provided by the hospital. The hospital is not responsible for patients’ property or for valuables and cash not left in safekeeping. At the time of admission, you will be asked to sign a general consent form for treatment and tests. For patients under the age of 14 years, the person with parental authority will be asked to sign on the patient’s behalf. For patients who are incapacitated, the curator, spouse, tutor or close relative may sign the consent form. For further information, contact the Social Service Department ((514) 398-1916) or the office of the Public Curator 514 873-4074. At the same time, you will be asked whether or not you agree to release medical information to your insurance company and/or to referring doctors, hospitals or clinics. You can choose not to release information outside the hospital. Please be assured that the refusal to release information will in no way influence the quality of the treatment you will receive. If the accommodation you prefer is not immediately available, we will try to provide it as soon as possible. You should let the Admissions Office know as far ahead of time as possible what type of accommodation you prefer. If you request a two-bed or one-bed room, you will be asked to make an advance deposit equal to seven days payment. Proof of insurance coverage is not accepted as a form of payment for one-bed and two-bed rooms. If you wish to change your accommodation after your admission, please ask your nurse to forward the request to the Admissions Office, or contact the Admissions Office directly (514 398-1900). Should a family member need to stay overnight, a cot can be set up in the patient’s room or in a nearby family room. If family members are from out of town and need to find accommodation, the Admissions Office (514 398-1900), the Neuro Patient Resource Centre (514 398-5358), or the Social Service Department (514 398-1916) can provide you with a list of hotels in downtown Montreal. For Quebec residents with a valid Medicare card, hospitalization charges and most outpatient services are fully covered, except for costs related to private accommodation. In accordance with an agreement between all Canadian provinces, patients from other provinces with a valid Medicare card from their home province are also fully covered, except for costs related to private accommodation. If you are a patient from any other country, or a Canadian resident without a valid Medicare card, you are responsible for all hospitalization expenses and professional fees for services received at the hospital. You must make an advance deposit equal to seven days payment upon admission to cover the hospitalization charges. You will also receive a bill for professional services. The advance deposit will be collected from a finance representative or may be made at the Office of the Patients’ Cashier at The Royal Victoria Hospital, 687 Pine Avenue West, Room C4.16. A deposit may be made in cash, by cheque, credit card or debit card. If you pay by credit card you can also do so by telephone (514 934-1934, local 34627). It is sometimes possible to obtain a temporary Medicare card if one has been lost or has expired. For all inquiries concerning your account, contact the Accounting Office during normal office hours (514 934-1934, local 42732). There is a daily hospitalization charge for patients who no longer require active medical treatment but have been identified as needing long-term care. These charges have been determined by the Quebec Ministry of Health and Social Services. Your doctor will advise you of this change of status and the Accounting Office (514 934-1934, local 42732) can provide more details. Ambulance charges are your responsibility unless a doctor has signed a form attesting to the fact that you require an ambulance for medical reasons or you are over the age of 65. The completion of forms for insurance and other purposes is not covered by Medicare and physicians may charge a small fee for this service. Certain medical treatments and services are not covered by Medicare. In these cases you will be informed. It is up to you to inquire whether or not your insurance plan will reimburse you. The hospital is not responsible for decisions made by insurance companies about reimbursement of services not covered by Medicare. If you have any questions concerning your bill, please call the Accounting Office (514 934-1934, local 42732). A variety of professionals will be involved with your care. Your nurse should be your first contact if you have questions about the care you receive. The Montreal Neurological Hospital is a teaching hospital. Students from a variety of healthcare disciplines may be involved in your care. Should you have a concern about their services or the services provided by any other healthcare professional of the hospital, please talk to your nurse. Address complaints about a student to his/her supervisor. The patient menu is planned using Canada’s Food Guide for Healthy Eating and other established nutritional standards. You may select your meal choices at any time, and they will be delivered to your room. Nutrition technicians from the Department of Clinical Nutrition will distribute and collect the menus from you. If you are unable to complete your menu, your technician will help you or make a selection for you. All patient rooms are equipped to provide telephone service. Local calls and toll-free calls can be made from your room or from the Neuro-Patient Resource Centre (room 354) by dialing “9” followed by the desired telephone number. Long-distance calls may be made by contacting Security at 5542. If your telephone is defective, please contact your Nursing station and ask them to communicate with the telecommunications department. You may use your cellular phone (or other wireless device) as long as you stay a minimum distance of one metre from any biomedical equipment. At The Neuro, you need to obtain a temporary username and password sheet in order to access the wireless internet. If your mobility is limited, please feel free to call the Centre (514 398-5358) and a staff member will be happy to bring you a sheet. If you have difficulties connecting to The Neuro’s wireless internet, please feel free to contact the staff at the Neuro-Patient Resource Centre (514 398-5358) and they will assist you to the best of their abilities. You may rent a television for a daily or a weekly fee from a private company. Please ask your nurse to help you arrange for this service. Forms and order boxes are available on each floor. It is your responsibility to pay the company directly. For safety reasons, you are asked not to bring electrically-powered appliances such as electric blankets, heating pads, hair dryers and curlers. Battery-operated appliances are permitted. You are responsible for the safekeeping of your appliances. They also offer access to wireless internet, computers, printers, a photocopier, a scanner, a fax and a telephone. Contact the Neuro-Patient Resource Centre by phone (514 398-5358), via email (infoneuro [at] muhc [dot] mcgill [dot] ca) or in-person in Room 354. The Spiritual Care Professionals (514 934-1934, local 34163) offer spiritual, emotional and religious support to patients and their families. They provide a caring presence during times of stress and will support you and your families in coping with illness or grief. This service is confidential, non-denominational and bilingual. The Spiritual Care Professionals are present in the hospital daily from 9 a.m. to 5 p.m. In emergencies, they are available 24 hours a day and can be reached through your nurse. In addition, Roman Catholic mass is held at the Royal Victoria Hospital (H4.79) on Wednesdays at 12:05 p.m. The MUHC has three Ombudsmen/Complaints Commissioners to assist patients and their families by investigating and helping to resolve complaints. Acting as a resource to staff, the Ombudsmen/Complaints Commissioners are available to help you if you have questions about patient’s rights or need advice to help resolve a conflict. The MGH Ombudsman/Complaints Commissioner can be reached by telephone (local 44285). The patient complaint system is governed by Quebec law, which is outlined in a brochure available at all sites of the MUHC. Members of the Patients’ Committee actively participate in the MUHC community by serving on hospital committees and advising hospital staff and administrators of the patient’s perspective, thereby assuring that the patients’ concerns are heard and their interests are defended. The committee also provides patients with information relating to their rights and responsibilities and will provide assistance, if needed, to patients filing a complaint. The Patients’ Committee is represented on the MUHC Board of Directors. To reach a member of the Montreal General Hospital’s Patients’ Committee, call local 42409 and leave a message. A member of the committee will respond to your call. With your doctor’s approval, you may hire private nursing staff through the nursing office. The fee for such services is your responsibility. Private duty nurses must work under the direction of the nursing staff on the unit but they may not be permitted in some specialized care areas. Please discuss this with your nurse. Interpreters are available if you or your family are unable to speak French or English, or if your understanding of these languages is limited. An interpreter may be requested on the patient’s behalf by the staff caring for them. The Friends of the Neuro (514 398-1923) visit patients, help at clinics and assist with general decorating in the hospital. They also supervise McGill University student volunteers who circulate a cart with a variety of personal items and reading material you might need during your stay. The Friends of the Neuro organize numerous fundraising activities throughout the year. The money raised, together with the proceeds of Café Vienne, is used to meet direct patient care needs. There are other volunteers who work mostly at the patient’s side in specialized programs (514 934-1934, local 34300). Some of the programs are friendly, seasonal parties for patients, humour, music, arts and crafts and special events. Patients, their families and friends can expect a visit from well-trained and supervised volunteers from all walks of life and all age groups. At the Neuro, a vending machine with a local French newspaper is available on the second floor. 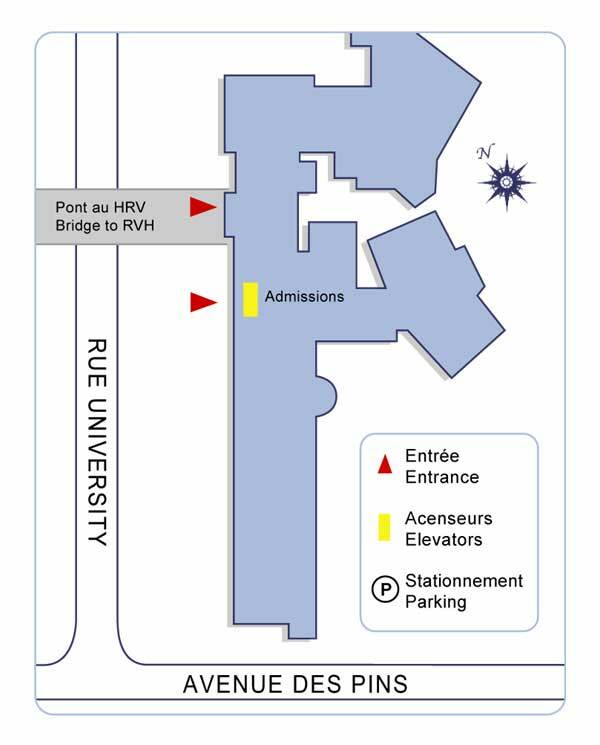 In addition, local English and French newspapers are available at the Royal Victoria Hospital at the Café Vienne on the first floor of the A pavilion as well as at the Jean Coutu pharmacy on the first floor of the Ross pavilion. All correspondence for you should bear your full name, floor and room number if possible. It is a good idea to include your maiden name, if applicable. Mail arriving for you after you have left will be forwarded to the address that you provided on admission or it will be returned to the sender. A mailbox is located at the Cedar Avenue main entrance on the sixth floor. Appointments with a hairdresser or barber can be arranged for Fridays by calling the recreation services (514 934-1934, local 34834). The hairdresser or barber can also come to your room. You are responsible for the cost of these services. Regular visiting hours are from 8 am to 9 pm. These hours may be modified based on a specific patient population or nursing unit’s needs. The goals of MUHC visiting guidelines are to ensure that our patients receive the best balance of rest, care and support. The patient and family are considered partners in care. The patient will identify their family or significant support. It is important for the healthcare staff to be able to provide care while maintaining a supportive and comfortable environment for patient and family. The number of family members and visitors in the room is dependent upon the condition and of the patient(s) in the room. Guidelines for the presence of family and visitors will be flexible and will respond to the preferences and changing needs of the patient. In some circumstances, an individualized visiting plan may be developed to respond to the needs of a specific patient and family or a safety-related concern. It will be developed collaboratively with patient, family and clinical staff. Visitors are guests of the patient. Regular visiting hours (which do not apply to family) are from 8 a.m. to 9 p.m. This may change based on patient/nursing needs. Children under the age of 12 must be accompanied and supervised by an adult. For the patient’s privacy, visitors and family may be asked to leave the patient room for a short period of time. • Respect restricted visiting rights. This normally occurs during an outbreak of a contagious illness. Mutual respect between family, visitors and healthcare staff is essential. Courteous and respectful behaviour is a requirement. If you wish to temporarily leave your room, please inform your nurse or somebody at the nursing station. It is important for the nursing staff to know where you are at all times. If you discover a fire or burning smell in your room, immediately report it to your nurse or someone at the nursing station. If you hear the fire bells ringing, follow the instructions of the hospital staff. For the safety of patients and staff, fire drills are held regularly. If a fire drill occurs during your stay, please follow the instructions given by your nurse. Smoking is not permitted in the hospital. There are designated smoking areas outside of the hospital. MUHC supports the Anti-Tobacco Act The MUHC strongly supports the Anti-Tobacco Act. Be advised that inspectors from the Quebec Ministry of Justice will visit each of the MUHC sites to ensure compliance with non-smoking areas and other regulations under the Tobacco Act. These agents will issue fines under the Act (L.R.Q., c. T-0.01), which will be paid to the Ministry of Justice, not to the MUHC. It is forbidden to smoke in all enclosed places. It is forbidden to smoke outside, within nine metres of any door. A person that smokes in a place where it is forbidden to do so is liable to a fine of $50 to $300, and for a subsequent offense a fine of $100 to $600 will be issued. Please report all accidents or falls to a staff member. Your doctor will inform you when he or she believes that you no longer need to stay in the hospital for active treatment. Your doctor will also let you know the approximate day of your discharge or of your transfer to transitional care. If you feel you will require support and care after you go home, your doctor, nurse or social worker will help you make any necessary outpatient arrangements. On the day of your discharge, you will be asked to check out of your room by 11 a.m. If you are unable to leave the hospital by this time, you can wait in the patients’ sitting room located on each patient unit. If there are outstanding charges, you should pay them before you leave. Payments are made at the Patients’ Cashier’s Office at The Royal Victoria Hospital, 687 Pine Avenue West, Room C4.16. You may pay with cash or by debit or credit card, in person or by telephone (514 934-1934, local 34627) if using a credit card. Please be sure to take all your possessions when you leave. If your nurse has placed your valuables in the Patients’ Cashier’s Office, you should claim them during office business hours, Monday to Friday, 8:30 a.m. to 12 noon and 1 p.m. to 4:30 p.m. If medications have been stored for you by the hospital, you may take them home but you should check with your doctor or nurse to determine whether your prescription remains the same. Your doctor may request that you return to a clinic at the hospital for a follow-up appointment. Before you leave, ask the nursing staff how to arrange this appointment. Parking is available in the P1 lot (located on Pine Ave. just west of University Ave. at the former Royal Victoria Hospital main entrance). In addition, there are eight (8) handicapped spots available at the Neuro Emergency Department entrance, just south of the main entrance. People may be dropped off/picked up at the hospital main entrance on University Ave. Vehicles must then either park in the parking lot or leave the premises. All entrances, exits and roads must be free of vehicles for safety and security reasons. The City of Montreal is permitted to issue parking tickets for vehicles illegally parked on Montreal Neurological Hospital grounds. 8 a.m. to 12 p.m. - 1 p.m. to 4 p.m.